Driving alone in your car can make the world around you fall away, that is until something or someone reminds you that you aren't out there all alone. Yes, some of the best people watching happens on the open road and luckily there are plenty of people to document all the cookyness. From clever license plates, bumper stickers and decals to people doing some bizarre multi-tasking (PSA we don't recommend playing the trumpet while driving) these people don't care what you think. 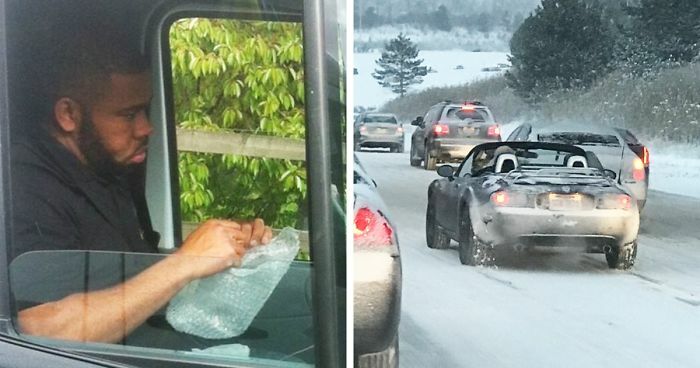 So put on 'Life is a Highway' and scroll down below to see some hilarious photos of drivers letting loose. Don't forget to upvote your favorites! If only he'd share his thoughts on the situation. #4 Saw This Fella On The Highway. The Sticker On His Helmet Says "Bad To The Bone"
I like the doggie ears sticking out, so cute. why you are sticking out your feet anyway so far? 100 points though to biker fella, a clear msg not all bikers are bad, even if they look bad. I do this many times, and passerby's love it. I have got quite a number thumps up. I tried doing that in office, but for some reason my co-workers wasn't amused. They made face exactly like him! *clap clap* FISTS! I love a good Queen reference! That and sliding ladders really creeps me out! Am I the only one wishing that there was another point in the elipsis?! #20 "5 Degrees In Cleveland Today With 30 MPH Winds? I Think I'll Take The Convertible"
LOL - I hadn't noticed the face and was wondering why the colour scheme looked so familiar. I drive a bus. I wish we could put sayings like this on them, but I get why we can't. We can change the signs, but only to predetermined codes/sayings. Those burning sort-of-brake lights, deep red color and horns, some people are just beyond creative! The black actually gives the impression of an arch; might confuse more drivers. Meanining more nourishment for Mr. bridge. Better than nothing, also red is color of caution so he did his best. I hope everyone is thoughtful like him when driving or stopping. He won’t pass until someone gives him his Banana!!! I really hate the assholes who want to pass on the right when everybody is waiting in line, and then they're the ones getting upset if you don't let them cut in front of you! #36 "I'm Really Sorry, They Got Me Driving 14 Hours A Day In This Thing And Also I'm A Dog"
He looks REALLY sorry, though. OK, this is a pretty good one - it deserves a few more likes! #41 What Would You Do? #46 They Have No Clue I'm In The Car. Should I Honk? Look ma - That Traffic cone is running away! I only hope the city fines and charge the person for this! Looks like molted sunshine on the road. A very beautiful mistake. #54 Things You See On Nigerian Roads. "Let's Just Have The Meeting On Our Way There"
But look at those stylish chairs!! Wow! Yeah, but where he keeps the money? #65 "Psst... Hey Kid... Wanna Stop?" The caption is so hilarious, if you play it in your mind, being the stop sign! Impressive! I would have thought it impossibly for a kangaroo to fall over - with that heavy tail and low centre of gravity. Honey, Alpaca lunch! Nahh we'll just stop at McDonalds but do pack the Alpaca. Driving holding an umbrella - what could possibly go wrong? ?